Of all the ways humans have combined calories and comfort, Italian cuisine might be the calorie-est and the most comforting. Sometimes, however, even a plate of chicken parm isn't up to obliterating every iota of worry and concern in your mind and body, and for those occasions, we present this elegant solution: a freakishly large chicken parm. 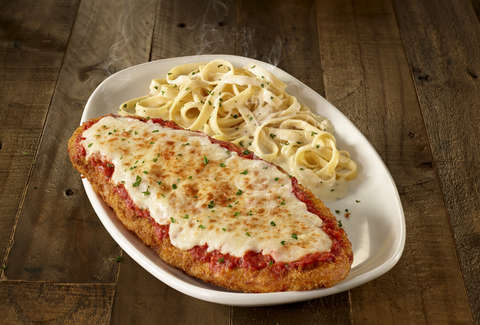 As of April 1, Olive Garden will be serving gargantuan versions of classic Italian dishes, including a chicken parm that's roughly 11.5-inches long and a meatball that weighs around 12oz. And all of them cost just $12.99. New! 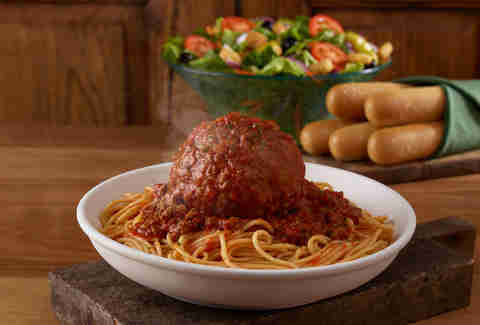 Giant Meatball with Spaghetti: House-made giant meatball topped with homemade meat sauce. Served with spaghetti. New! Giant Chicken Parmigiana: Oversized chicken parmigiana, topped with homemade marinara sauce and melted mozzarella. Served with fettuccine alfredo. New! Giant Four-Cheese Stuffed Shells: Four-cheese giant stuffed shells topped with homemade marinara, alfredo and toasted breadcrumbs. New! Giant Stuffed Shells with Shrimp: Four-cheese giant stuffed shells topped with shrimp, homemade alfredo sauce and seasoned tomatoes. If you're worried this isn't enough food, 1) good for you and 2) don't worry: All four dishes come with unlimited breadsticks and homemade soup or salad. Unfortunately, we'll only live in this world where everything is beautiful and nothing hurts from April 1 to May 27. Then again, it might make take you that long to just get through that meatball.